- Parliamentary legislation bills should be taken with a pinch of salt because they will never be complied with. - We need to support each other; bodies only, help by attending courts etc. challenging all applications to pins and claims to occupation rites by wildlife trusts, council rangers, none have any rites above that of the general public. Wat Tyler (Walter the Tyler) heard of him? 1381 peasant's revolt, he was fighting the injustices on behalf of his countrymen dished out by the state, churches barons and lords of the Manor. This man was not a criminal but believed that as we all "allegedly" came from Adam and Eve we were all equal, but then again, Adam and Eve act as a fate accompli, they did not really exist but as Christianity was forced upon us and as they are claimed to be children of "god", then with the strength of the Churches and the Monarch, Christianity became another fate accompli and its agendas a fear factor, this to control the masses of the land. 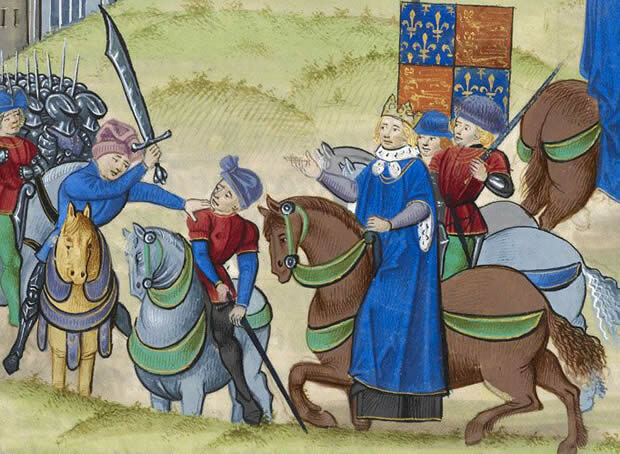 Wat Tyler was executed on the 15th of June 1381, yet he had accepted the word of the Monarch and other nobility that if the protest was stopped all would be well. We all know that Wat Tyler was murdered by the establishment; the statement that was given to halt the protest was dismissed as being made under stress. Well the Wat Tyler days are still with us, of course hanging and all other such forms of punishment have been done away with, however, we still have the same corruption within our government this is by way of being organically linked to evolution, it includes police, solicitors, judges and the corrupt local councils. The laws are written so that everyone may understand them, created by our MP's and passed by Parliament; the new laws were given Royal Assent, the public were not consulted because the new laws are meant to control the public, but in certain areas of the public's activities, the laws are bent to accommodate the wills/agendas of those that are meant to administer the laws. Your MP, even if your MP is of the party in power will not support you, but then again other MP's from the opposition will not support you if your fight is with local government and those that it supports no matter what imposition is placed upon you. Our freedom to roam has been in place from time immemorial providing we are not committing any act of vandalism, there are still in situ footpaths and bridle paths of ancient rights and gained by ancient rites of passage and only suspended on requisition by the Military. However, there is theft of our lawful rites of access by those that are in office to protect our rites; instead these are the ones that "bend" the law and are part of the criminal band that uses bullying tactics and fraud to steal the land by claiming ownership yet cannot disclose legal occupation documents either. The authorities/councils are in the driving seat, they are able, either by threat or bribery to steal or allow being stolen/unlawfully occupied registered common lands and there cannot be any other explanation for the council's actions. The authorities prevent Judges, police, land registry, district auditor, newspapers and solicitors from exposing the corruption which is endemic in the council offices and elected officers supported by the idle rich MP's. The lands registration acts 1925 and 1936 was to discover what was what in the claims of ownership/demesne lands of an estate to include waste lands( what could be described as common lands) of that estate, to have registered the lands under the lands registration acts so as to be included under the statute 1925 law of property act, applicants were required to show legal ownership documents that pre-dated the time of legal memory 1189 the date of the assent to the English throne of Richard1 and that the claim was not post 1290 Quia Emptories after which date no new Manors could be made/registered. So, the 1965 commons registration was to register unclaimed waste lands of the Manor referred to before the 1189 act as common land and used by the common folk to benefit their own homesteads, through use by villagers etc. rites of common were established and so for the 1965 act, persons that could demonstrate use by right and not by custom were registered as commoners and with rites to the product the common lands could produce, but this was and still is by what the application lands could sustain for the 12 months of each year, commoners are prohibited by the registration act from, letting, leasing, selling or extinguishing the right, so attached to the property. The waste/common lands were registered then to the property and the unclaimed lands were vested into the care and protection of the local registering authority however, the vesting gave no jurisdiction, all of this information may be gained from the local authority, any registration application made to the land registry should be refused as that government office has no jurisdiction because the common land is not freehold and therefore is not "property". The true meaning of "wastes" or waste lands or waste grounds of the Manor, is the open, uncultivated and unoccupied lands parcel of the Manor, or open lands parcel of the Manor other than the demesne lands of the Manor, AG V Hanmer (1858) such were common lands registered as section 9 1965 act. To mislead the public and commoners though land registry does accept applications from councils and from charities it supports even though the is evidence to show the land is not freehold and not subject to fee simple (1290 Quia Emptories), they also support false claimants because of its own guilt, like stealing common lands for its own fraudulent use to make profit (2006 fraud act, using land not owned as collateral). I started this letter by recalling Wat Tyler and his position in the protest campaign and how he accepted the words of the countries legal establishment, the law maker's assurances, well, such words are now in print, passed by Parliament and given Royal Assent, as in Tyler's case, the parliamentary legislation bills should be taken with a pinch of salt because they will never be complied with. Today, hanging and flogging is gone, in its place is intimidation, threats of imprisonment, exaggerated fines and court costs, injunctions and other corrupt threats to penalise those that observe the law by working well within the legislation section/acts/paragraphs, some of the laws of this land stem from the magna carta, most now are part of the ECHR 1998, article 6 provides that any person subject to arrest is entitled to have full disclosure of evidence against him/her, to examine the witnesses against him/her or for a solicitor to examine the evidence, because the claimants are the local authority or a charity or another person, your rites are disallowed and the outcome is you are found guilty by a judge committing courtroom fraud, but found guilty is not enough, one must be proved guilty and without rites under article 6, you will never be proven guilty, how can you? Article 7 ECHR is no punishment without law, claimants are required to disclose documentation in order for an arrest to be made, I have stated this on the many times I have been arrested and refuse to make a statement or to sign bail conditions, the police have no powers of arrest unless a public order offence is in progress sec 5. Solicitors of today obviously evolved from Wat Tyler's day will perform courtroom niceties to the judge, your instruction will never be complied with so you have no defence, guilty again, newspaper lick the boots of the council and so the matters are never laid open for public comment. There has been success in saving some common lands from development, ancient public rites of access also, but the ignorance of the planning inspectorate is a problem, neither office of that quango is educated in common land, or conveyance procedure, they don't need to be, this is the corrupt agenda of the last Labour party when the commons commissioners post was extinguished, no need to send documentation to show ownership, objectors too need not to disclose because pins officers are not allowed to adjudicate, so mostly consent is given, but so as not to be identified as bias, pins runs with the fox and hounds by issuing a supplementary which states that providing the works are not in breach of any enactment or bylaw the works will be lawful. The application is in breach of an enactment (false representation 2006 fraud act) as the commons in dispute are Rural; there are no bye-laws. If the wastes of the Manor were not registered as demesne lands for the lands registration act 1925 and 1936, then they are not a disposal asset, and are open from all pints of view, just recently I was contacted with information of the intention by National Parks to charge toll for public access, the parks are common lands that have been brought under the National Parks act subject to an access agreement under the National Parks and access agreement to the countryside 1949. The National Trust are corrupt they claim to own common land that they do not but the way a fate accompli is engineered is by causing unlawful applications to pins to be made and suggest that the applicants to state that the applications should be made by using the national trust act 1971 sec 23 and are prone to make rental demands, as in Frensham, all charities are part quango, they will support the government in decisions on our common lands and access issues because there is no tax demands on donations. The common lands occupied by the Forestry Commission is for the growing of timber only, public access, bridle paths and foot paths are of ancient origin but tolls are being demanded, this is unlawful, the land is common, holds commoners rites and like all common lands do not hold any public liability certificates, the demands should be ignored, this is now happening throughout by horse riders. We need to support each other; bodies only, help by attending courts etc. challenging all applications to pins and claims to occupation rites by wildlife trusts, council rangers, none have any rites above that of the general public.